Megawangi, Ratna, Kramer, Ellen M., Colletta, Nancy Donohue, Babatunde, Emmanuel D., Garman, David, Zeitlin, Marian F.
Synopsis: This book explores the characteristics of families that strengthen the family unit and promote the development of its individual members. Following upon an earlier research project on the development of children in poverty, the present study examines how family social health improves the well-being of children and how family functioning interacts with national and international development. The authors argue that the smallest unit of analysis for sustainable development is neither the household nor the individual, but rather the family; and they stress that the success of development policies and programmes closely depends on a recognition of this. To test their hypotheses concerning associations between family heath, child development, and general social development, the authors study two very different family types--the Javanese of Indonesia and the Yoruba of Nigeria. 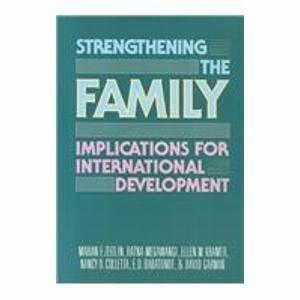 The book also considers the effects of modernization on the family; the usefulness of mathematical modes in quantifying the effects of family change on economic development and human welfare; psychological studies of the family; and development assistance programmes. In the concluding section the authors present a unified cross-disciplinary paradigm of the socially-well family, and also suggest policy and programme priorities. Megawangi, Ratna; Kramer, Ellen M.; Colletta, Nancy Donohue; Babatunde, Emmanuel D.; Garman, David; University, United Nations; Zeitlin, Marian F.